Mico Kaufman’s 1984 “Homage to Women” captures the determination of Lowell’s 19th century mill girls. Like many of New England’s postindustrial cities struggling to reinvent themselves, Lowell has attracted a thriving artistic community to its old warehouses. And as a magnet for generations of immigrants since the Merrimack and Concord rivers were harnessed to power cotton mills in the 19th century, the city has also attract a rich array of cuisines and cultures. The late U.S. Senator Paul Tsongas helped to create a popular national park in Lowell. Today, others are building on the city’s arts reputation to attract tourists while strengthening ties among the various nationalities. Yesterday I decided to check out one of the city’s newest festivals, “Creaticity.” Despite good weather, music, food, giant bubbles, and booths that featured artisans of many ethnicities, the event didn’t have anything like the attendance of the city’s 31-year-old folk festival. But you couldn’t expect that. It probably just needs time to get established. Here are a few Lowell scenes to give you a taste. The last photo is an editorial comment on how challenging it can be to unlock all the inherent beauty of a city like Lowell. Sometimes it just takes one person to be a catalyst. Internationally known jazz musician Danilo Pérez is a catalyst for a growing jazz scene in his native Panama. He has a special focus on getting young people excited about jazz and giving them a chance to become musicians. At the NY Times, Melena Ryzik writes, “Even in jazz, which has a long tradition of mentorship, Mr. Pérez, 49, has emerged as a singular figure. Nearly 30 years after he left his native Panama to study jazz composition at Berklee [College of Music in Boston], he has made promoting musicianship in Panama — using music as a springboard, cultural unifier and teaching tool — his life’s work. Danilo Pérez (right) directs the Berklee Global Jazz Institute inaugural class. The Upper Midwest has some unusual races. One year in Minnesota, for example, my husband and I went to an outhouse race, and I wrote up the experience for an East Coast community paper. Today I read in the NY Times about a Wisconsin race. Mitch Smith writes, “In Spain, they run bulls. In Kentucky, thoroughbreds. But here in America’s Dairyland, llamas are the four-legged athletes of choice. “On Saturday afternoon, the llamas converged on this tiny town in the corn-covered hills of western Wisconsin, as they do each September. A llama named Lightning, a 14-year-old with swift feet and a bit of a temper, claimed the heaping basket of tomatoes and peppers that goes to the speediest camelid. 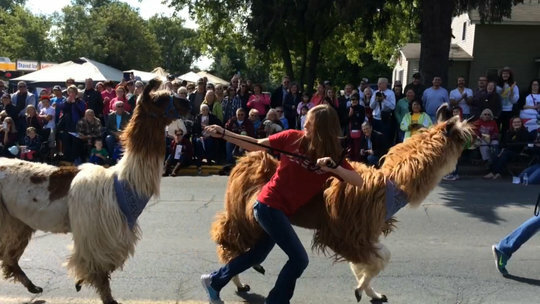 “To the roughly 1,900 residents of Hammond, the Running of the Llamas is something far more than an annual excuse to watch South American pack animals lope down Davis Street. In the 18 years since a local bar owner first let the llamas loose, the event has become a source of communal pride and identity in a state where it seems every dot on the map has its own quirky festival. “Some llamas were eager to race, sprinting swiftly behind the handler holding its reins. Others were compliant but unenthusiastic, making their way past the cheering fans, lined up four and five deep on some stretches of sidewalk, at more of a brisk walk than a run. And a few llamas were downright uninterested, forcing their handlers to practically drag them to the finish line.” More here. Suzanne and Erik’s two-year-old fed a llama this summer. I can’t quite picture that llama wanting to do anything but eat. Photo: Colin Archdeacon on Publish September 14, 2014. This llama-racing event is in its 18th year in Hammond, Wisconsin. After a delightful morning with my granddaughter and my older grandson, I went to Providence to hang out with my younger grandson and Suzanne and a good friend. 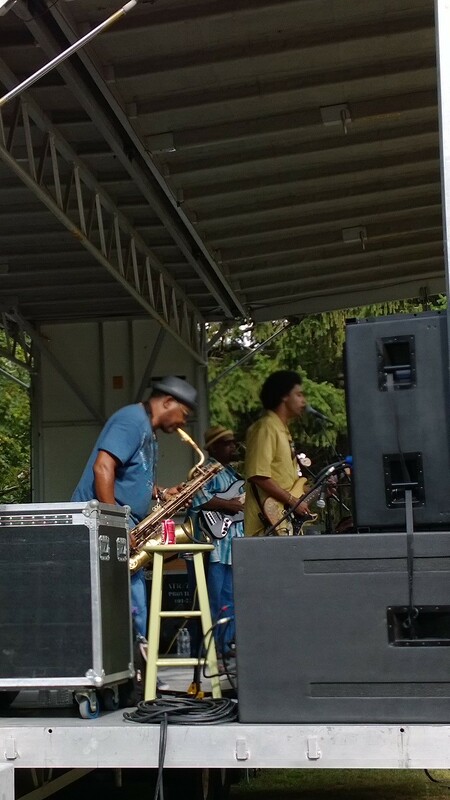 The four of us liked a blues group called the Selwyn Birchwood Band (pictured) and another band called Smith and Weeden. The ice cream eater below had reservations about a third performance. Everyone’s a critic. We spent a chunk of time going “higher, higher” on the swing in the playground and watching a multi-ethnic group of small boys kick a soccer ball. (How brave it is to go up to boys you don’t know and ask to play!) 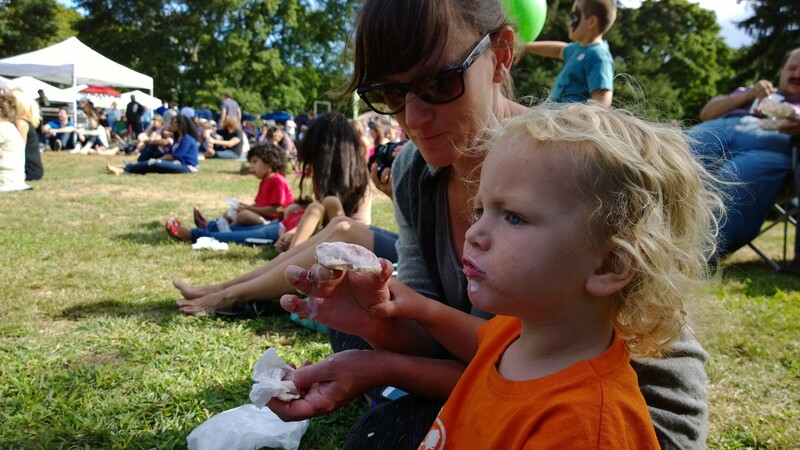 We skipped the face painting, which was gorgeous but, to a 2-year-old, kind of pointless. 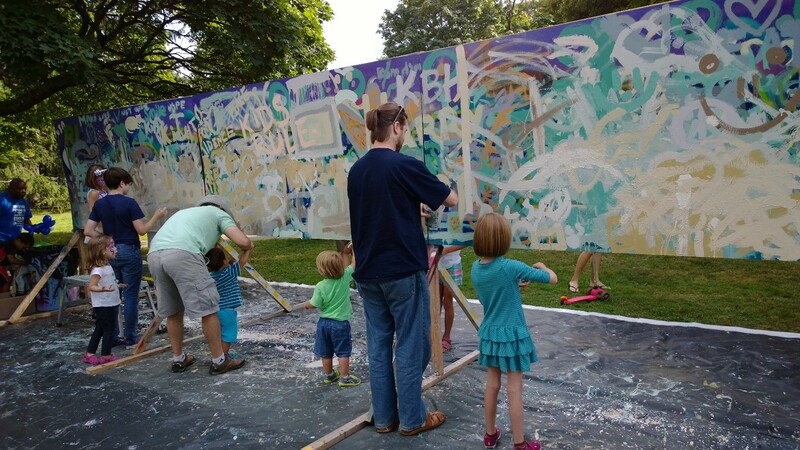 We watched kids and grownups painting a mural wall.